Note: To make dashi panna, Chef Whitaker toasts kombu and combines it with water to make dashi. He then mixes the dashi with heavy cream and reduces it until thickened. 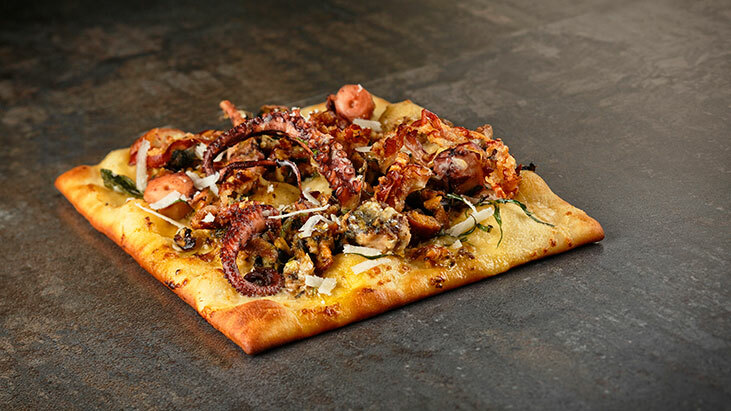 Menu mentions of flatbreads have increased more than 34 percent since 2011, according to Datassential MenuTrends, with almost 11 percent of restaurant menus now featuring the item. When making flatbreads in his Cart-Driver restaurant, a tiny eatery housed in a shipping container, chef Kelly Whitaker faces limitations on space and ingredients. He often relies on sardines, octopus and other canned seafood, imported from Italy, as toppings for his wood-fired flatbreads. Bring prepared pizza dough to room temperature. Preheat oven to 400 F, ideally with a baking stone, also preheated. Liberally dust work surface with flour. Flatten dough to a 12-inch square. Spread dough with a thin layer of dashi panna for sauce. Top with seafood, pancetta, roasted garlic and pecorino. Bake in oven 15 minutes or until nicely caramelized and cooked through. Finish with a drizzle of sesame oil. Slice and serve with hot sauce and drained can juices, if desired. Note: To make dashi panna, Chef Whittaker toasts kombu and combines it with water to make dashi. He then mixes the dashi with heavy cream and reduces it until thickened.